“Malevich and The American Legacy,” an exhibition at Gagosian, traces a line from the geometric work of post-war American artists (all male except for Agnes Martin) back to Kazimir Malevich’s Suprematist paintings, but the connection constructed between the Americans and Malevich often seems overly reliant on visual tropes rather than substantial philosophical underpinnings. Had curator Andrea Crane included a wider range of work, the exhibition would have yielded a livelier, more engaging experience. My favorite pieces were the less religious, more playful selections, and I kept thinking that Elizabeth Murray‘s work might have provided a counterpoint to the stolid monochromatic approaches of Carl Andre, Dan Flavin, Donald Judd, Ellsworth Kelly, Barnett Newman, Ad Reinhardt, Richard Serra, and Frank Stella. 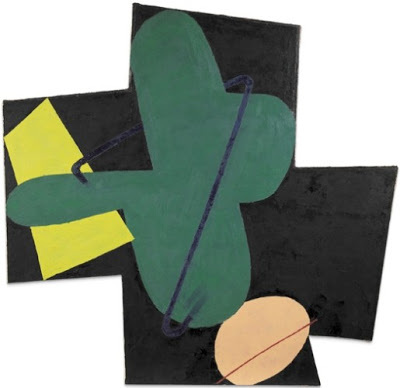 In the context of the new offhand, provisional strategies artists are applying to abstraction today, the rigor and heft of Minimalism are beginning to feel old-fashioned. 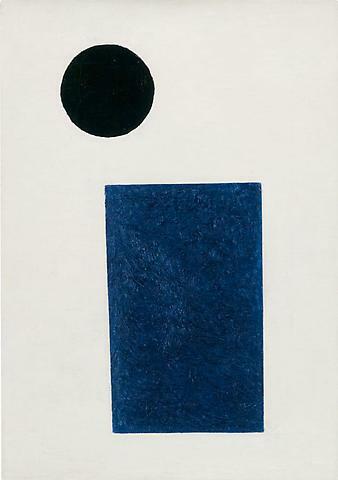 Malevich’s quirky, intuitive, small-scale abstractions, on the other hand, seem fresh. 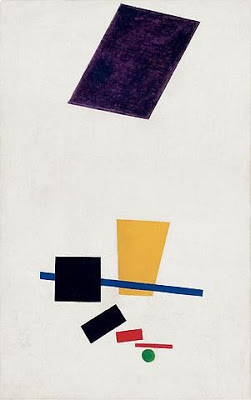 Kazimir Malevich,”Suprematist Composition: Airplane Flying,” 1915, oil on canvas, 22 7/8 x 19,” Courtesy The Museum of Modern Art, New York. In the center, Agnes Martin’s “Homage to Life,” 2003, acrylic and graphite on canvas, 60 x 60″ looks like it’s being held captive in Richard Serra’s paddock. I would have liked to look at it more closely because at a distance the tactile nuance of Martin’s surface is unreadable. 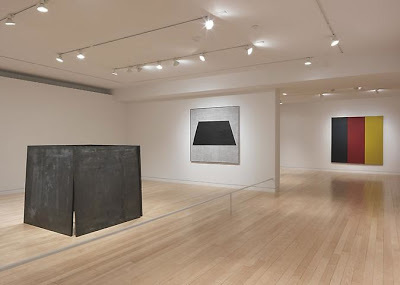 At left: Richard Serra, “One Ton Prop (House of Cards),” 1969, lead, four plates, each 48 x 48 x 1.” In the back, check out Brice Marden “Red, Yellow and Blue III,” 1974, oil and wax on canvas, 74 x 72.” It reminds me of Blinky Palermos’ 1976 piece “To the People of New York City,” which is included in the Palermo retrospective at the Hirshhorn right now. Ed Ruscha, “You Will Eat Hot Lead,” 1999, “Say Yes to Our Demands or Else,” 1999, “I Will Wipe You Off the Face of This Earth,” 1999, “and “Stick up Don’t Move Smile,” 2001, each is bleach on linen-covered board, 20 x 16.” Although the subdued colors fit in, the arch humor and intuitive approach of these modestly scaled paintings seemed out of place. 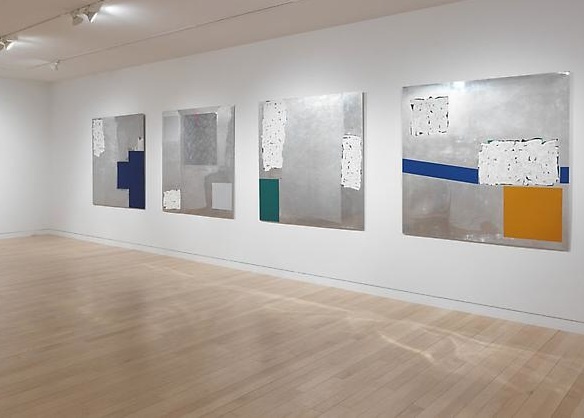 Robert Ryman, untitled paintings from 1963, vinyl polymer acrylic on aluminum, 60 x 60.” These peices have a high-spirited playfulness that I’ve never seen in Ryman’s work before. They almost look like they could have been made by Cordy Ryman. Kazimir Malevich, “Painterly Realism of a Football Player—Color Masses in the 4th Dimension,” 1915, oil on canvas, 27 1/2 x 17 3/8″, The Art Institute of Chicago. 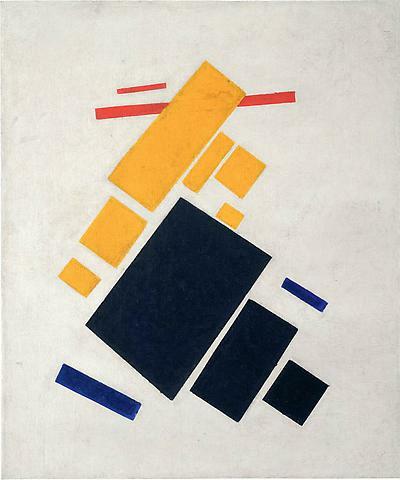 “Malevich and the American Legacy,”curated by Andrea Crane, Gagosian, New York, NY. Through April 30, 2011. 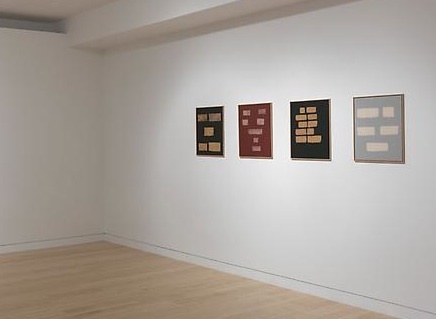 Artists include Carl Andre, John Baldessari, Alexander Calder, Dan Flavin, Donald Judd, Ellsworth Kelly, Agnes Martin, Barnett Newman, Ad Reinhardt, Ed Ruscha, Robert Ryman, Richard Serra, Frank Stella, James Turrell, and Cy Twombly. I'm very sorry I missed this show. I wanted to see those Ryman's. They do seem out of place for him. Just wanted to say thank you for this blog- I just discovered it this past week and have enjoyed it all so much!